Mehta, V. Comparison of Forced Air and Conductive Heating Systems During Outpatient Orthopedic Surgeries. (2018) J Anesth Surg 5(1): 13- 16. © 2018 Mehta, V. This is an Open access article distributed under the terms of Creative Commons Attribution 4.0 International License. Background: It is critical to maintain a normal or near-normal body temperature during and after surgery. Traditionally this has been done using a forced air device. One of the main concerns with forced air devices is that they may increase bacterial contamination in the surgical field before and during surgery. Recently, conductive heating systems have been developed and used to address these concerns. While these devices do not disrupt airflow at the surgical site, their efficacy versus forced air devices has been called into question. Purpose: The purpose of this study is to compare the efficacy of a forced air device to a conductive heating device in their ability to maintain perioperative patient normothermia. Methods: 50 patients undergoing outpatient orthopedic procedures were randomized into either the Forced Air group (FA) or Conductive Heat group (CH). In the patients randomized to the FA group, a Bair Hugger™ (Arizant Medical, Inc., Eden Prairie, Minnesota) forced-air cover was positioned over the upper body (if lower extremity surgery) or lower body (if upper extremity surgery). In patients assigned to the CH group, a VitaHEAT Medical® (VitaHEAT Medical, LLC , Rolling Meadows, IL) conductive heating device was placed under the torso of the patient. Following standard surgical protocol, patients in both groups were draped appropriately. Stabilization of the ambient temperature was maintained near 20°C. Data regarding demographics and anthropometrics wsa recorded. Patient temperature was recorded at 15 minute intervals throughout the surgery and throughout the recovery room stay. Intraoperative and recovery room temperatures between the two groups were compared using a student’s T-test. Conclusion: There was no difference between intra-operative and recovery room temperatures between patients using either a forced air device or a conductive heating device. Those involved in perioperative care should be familiar with conductive heating devices as a potential alternative to traditional forced air devices. Clinical Relevance: Conductive heating devices may cause less contamination at the surgical site than forced air devices. However, the efficacy of conductive heating devices is largely unknown. This study demonstrates that conductive heating devices are as efficacious as forced air devices. It is critically important to maintain a normal or near-normal body temperature during and after surgery. During surgical procedures, patients’ core body temperatures decrease which can lead to perioperative hypothermia (perioperative core temperature < 36.0°C). The cause of the decrease in body temperature is multi-factorial with one of the main reasons being thermal redistribution. Thermal redistribution occurs after the induction of anesthesia and can account for up to 1.6°C decrease in the core body temperature[1,2]. This decrease in core body temperature can then lead to significant complications. Reported complications of hypothermia include impaired wound healing, prolonged drug action, negative postoperative nitrogen balance, coagulopathies, cardiac events and increased duration of hospital stay[3-9]. In fact, 1.9°C core hypothermia was found to triple the incidence of surgical wound infection after colon resection and increase the hospital stay by 20%[6-10]. For these reasons, the maintenance of perioperative normothermia has rightfully become a priority of anesthesiologists, surgeons and the entire surgical team. Many strategies have been employed to maintain a normal body temperature during the surgical period. These include: pre-warming, fluid warming, forced-air devices, conductive heating devices, increasing the ambient temperature, covering the body as much as possible and others[8,11,12]. Forced air devices have been studied and demonstrated to help decrease postoperative hypothermia[13-15]. Conductive heating devices have also been studied with demonstrated efficacy[16,17]. There is concern that conductive warming devices may be less effective, as they primarily function by warming the back and torso which may be a less efficient method of heat exchange than warming the extremities[18-20]. Recently, it has been demonstrated that forced air devices may interfere with laminar flow conditions in orthopedic operating rooms, potentially introducing contaminants around the surgical site and increasing infection rates[21,22]. The purpose of this study is to compare the efficacy of a forced air device to a conductive heating device in their ability to maintain perioperative patient normothermia during outpatient orthopaedic surgeries. Fifty patients undergoing outpatient orthopedic surgeries were randomized into either the Forced Air group (FA) or Conductive Heat group (CH). Randomization was performed using a random number generator. All necessary approvals were obtained from the local Institutional Review Board. In the patients randomized to the FA group, a Bair Hugger™ (Arizant Medical, Inc., Eden Prairie, MN) forced-air cover was positioned over the upper body (if lower extremity surgery) or lower body (if upper extremity surgery). In patients assigned to the CH group, a VitaHEAT Medical® (VitaHEAT Medical, LLC, Rolling Meadows, IL) conductive heating device was placed under the torso of the patient. Patients in both groups were otherwise draped per surgical routine. Ambient temperature was maintained near 20°C / 68°F. Demographic and morphometric characteristics were recorded. Patient temperature was recorded at 15 minute intervals throughout the surgery and throughout the recovery room stay. Intraoperative and recovery room temperatures between the two groups were compared using a student’s T-test. There were no significant differences noted in demographics between the two groups (Table 1). No statistically significant difference in mean intra-operative temperatures was found between the two groups (FA = 97.95°F / 36.64°C and CH = 97.64°F / 36.47°C, p = .063). In addition, no statistically significant difference in mean recovery room temperatures was found between the two groups (FA = 97.68 °F / 36.49°C and CH = 97.53°F / 36.41°C, p = .39) (Figure 1). 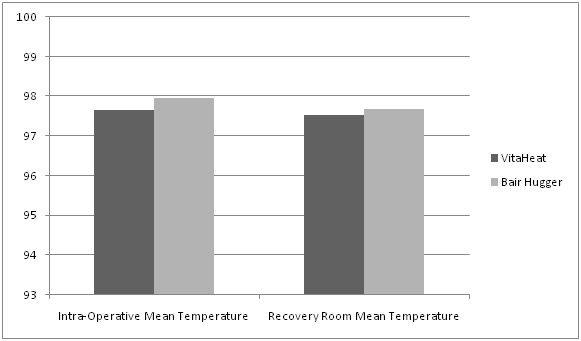 Figure 1: Comparison of Mean Intra-Operative and Recovery Room Temperatures Between the Groups. It is widely agreed upon that maintaining a normal perioperative temperature is beneficial to the patient for many different reasons. Nevertheless, discussion continues about the optimal way to perform patient warming. In this study, two methods of patient warming are compared: forced air and conductive heat. We found no statistically significant difference between the two methods in this patient population. Others have studied the effects of these two heating methods in both laboratory and clinical settings[14,17,22-25]. Nieh et al, studied the effects of forced air warming on patients undergoing laparoscopic procedures. They randomized 127 patients into either a forced air warming group or a control group. They found the forced air group to have a lower incidence of post-operative hypothermia and a higher core body temperature. In addition, this group had a shorter time for rewarming and a higher comfort level. In a study using healthy volunteers, Brauer et al sought to determine heat transfer by circulating water mattresses placed under the back and on the legs of eight subjects. Heat flux and heat transfer were subsequently calculated. They concluded that “…a gel-coated circulating water mattress placed only on the back of eight subjects could not replace a forced-air warming system”. This same group went on to perform a randomized trial of a forced air device and a conductive warming device. 60 patients undergoing video assisted thoracic surgery were randomized to either the forced air group or the conductive warming group. The forced air group consisted of convective warming with an underbody blanket. The conductive warming group consisted of an underbody mattress and additional warming of the legs. The authors found that the conductive warming group had lower intraoperative core temperatures and a higher incidence of both intraoperative and postoperative hypothermia. They concluded that convective warming was superior in patients undergoing this procedure. They also postulated that the inferior performance of conductive warming may be because the patients are in the lateral decubitus position and therefore there is reduced body contact which can negatively affect the efficacy of conductive warming systems. John et al also compared the efficacy of a forced air device and a conductive warming device in a randomized trial. The authors randomized 160 patients into either forced air or conductive warming using a resistive heat mattress. They found significantly higher rates of hypothermia in the conductive warming group and reached the conclusion that forced air is more effective in reducing postoperative hypothermia. Buisson et al studied the warming potential of both a forced air device and a conductive warming devices during abdominal surgeries in neonates and found forced air warming to me more effective. Several studies have looked at conductive warming devices and found them to be effective as well[16,17,19]. Ruetzler et al compared a conductive warming device to a forced air device in a randomized trial of patients undergoing abdominal surgery. They found that the two systems transferred comparable amounts of heat and both were suitable for maintaining normothermia even during long operations. There are certainly pros and cons to both forced air and conductive warming devices. Most conductive warming devices are placed on the torso of the patient and therefore may be inherently less effective, as vasodilation occurs after the induction of anesthesia than peripheral warming potentially superior. In addition, certain surgeries are performed in the lateral decubitus position which reduces the amount of body surface area that is in contact with the conductive warming device. This may reduce the efficacy of such devices. One of the major concerns that have been voiced recently about forced air devices is that they have the potential for increasing contaminants at the surgical site. An increase in infection rates around commonly performed procedures such as knee and hip replacements would be a devastating complication. The concern about increased infection risk is based on the fact that forced air devices have been shown to generate convection current in the vicinity of the surgical site. This convection current could disrupt ventilation systems designed to prevent infection. One study looking at this issue in particular demonstrated that forced air devices disrupt ventilation airflows over the surgical site while conductive warming devices had no demonstrable effect. In this study, we sought to compare the efficacy of a conductive heating device and a forced air device in maintaining perioperative normothermia during outpatient orthopedic surgery. Our study reveals equivalent abilities of these to modalities in maintaining perioperative normothermia with no statistically significant differences between the two groups. This study has several limitations. Firstly, temporal temperatures were used. This is not an accurate measure of core body temperature, but we believe that by using a consistent method of temperature measurement between the two groups we are able to compare the efficacy of the two even though we are measuring a proxy of core body temperature. In addition, this is the temperature that is typically monitored by anesthesiologists and the perioperative team in this setting and thus represents a clinically relevant measure. Secondly, the sample size of this study is limited, and it is possible that a larger study may reveal additional information or potentially differences between the groups. Thirdly, it is important to note that there is likely not a single best solution to the perioperative warming issue. Every surgery is different and warming ability depends upon the procedure and setting. For example, an orthopedic surgeon performing joint replacements may be particularly concerned about disruption to laminar flow and potential for increased infection. Conversely, during surgeries that involve prepping and draping of the torso, forced air devices that cover the extremities may be more desirable. In summary, we have demonstrated equivalent efficacy of forced air and conductive warming devices in maintaining intra-operative and post-operative normothermia in an outpatient orthopedic surgery center. The surgical team should be aware of the importance of avoiding hypothermia and understand methods to prevent it from occurring including the use of both forced air devices and conductive warming systems. Acknowledgement: Vitaheat for providing funding for this study. 1. Andrzejowski, J.C., Turnbull, D., Nandakumar, A., et al. A randomised single blinded study of the administration of pre-warmed fluid vs active fluid warming on the incidence of peri-operative hypothermia in short surgical procedures. (2010) Anaesthesia 65(9): 942-945. 2. Sessler, D.I. Perioperative heat balance. (2000) Anesthesiology 92(2): 578-596. 4. Torossian, A., Brauer, A., Hocker, J., et al. Preventing inadvertent perioperative hypothermia. (2015) Dtsch Arztebl Int 112(10): 166-172. 5. Da, Silva, A.B., Peniche, Ade, C. Perioperative hypothermia and incidence of surgical wound infection: a bibliographic study. (2014) Einstein (Sao Paulo) 12(4): 513-517. 6. Kurz, A., Sessler, D.I., Lenhardt, R. Perioperative normothermia to reduce the incidence of surgical-wound infection and shorten hospitalization. Study of Wound Infection and Temperature Group. (1996) N Engl J Med 334(19): 1209-1215. 7. Kurz, A. Physiology of thermoregulation. (2008) Best Pract Res Clin Anaesthesiol 22(4): 627-644. 8. Young, V.L., Watson, M.E. Prevention of perioperative hypothermia in plastic surgery. (2006) Aesthet Surg J 26(5): 551-571. 9. Leaper, D. Effects of local and systemic warming on postoperative infections. (2006) Surg Infect (Larchmt) 7 Suppl 2: S101-103. 10. Reynolds, L., Beckmann, J., Kurz, A. Perioperative complications of hypothermia. (2008) Best Pract Res Clin Anaesthesiol 22(4): 645-657. 11. Cooper, S. The effect of preoperative warming on patients’ postoperative temperatures. (2006) AORN J 83(5): 1073-1076, 1079-1084. 12. Kiekkas, P., Karga, M. Prewarming: preventing intraoperative hypothermia. (2005) Br J Perioper Nurs 15(10): 444, 446-447, 449-451. 13. Tomasic, M. Temporal changes in core body temperature in anesthetized adult horses. (1999) Am J Vet Res 60(5): 556-562. 14. Brauer, A., English, M.J., Steinmetz, N., et al. Comparison of forced-air warming systems with upper body blankets using a copper manikin of the human body. (2002) Acta Anaesthesiol Scand 46(8): 965-972. 15. Emmert, A., Franke, R., Brandes, I.F., et al. Comparison of Conductive and Convective Warming in Patients Undergoing Video-Assisted Thoracic Surgery: A Prospective Randomized Clinical Trial. (2017) Thorac Cardiovasc Surg 65(5): 362-366. 16. Murakami, W.M. External rewarming and age in mildly hypothermic patients after cardiac surgery. (1995) Heart Lung 24(5): 347-358. 17. Brauer, A., Pacholik, L., Perl, T., et al. Heat transfer by conductive warming with circulating-water mattresses. (2004) Anasthesiol Intensivmed Notfallmed Schmerzther 39(8): 471-476. 18. Brauer, A., Perl, T., Quintel, M. Perioperative thermal management. (2006) Anaesthesist 55(12):1321-1339; quiz 1340. 19. Pagnocca, M.L., Tai, E.J., Dwan, J.L. Temperature control in conventional abdominal surgery: comparison between conductive and the association of conductive and convective warming. (2009) Rev Bras Anestesiol 59(1): 56-66. 20. Buisson, P., Bach, V., Elabbassi, E.B., et al. Assessment of the efficiency of warming devices during neonatal surgery. (2004) Eur J Appl Physiol 92(6): 694-697. 21. Belani, K.G., Albrecht, M., McGovern, PD., et al. Patient warming excess heat: the effects on orthopedic operating room ventilation performance. (2012) Anesth Analg 117(2): 406-411. 22. Dasari, K.B., Albrecht, M., Harper, M. Effect of forced-air warming on the performance of operating theatre laminar flow ventilation. (2012) Anaesthesia 67(3): 244-249. 23. Brauer, A., English, M.J., Steinmetz, N., et al. Efficacy of forced-air warming systems with full body blankets. (2007) Can J Anaesth 54(1): 34-41. 24. Ruetzler, K., Kovaci, B., Guloglu, E., et al. Forced-air and a novel patient-warming system (vitalHEAT vH2) comparably maintain normothermia during open abdominal surgery. (2011) Anesth Analg 112(3): 608-614. 25. Brauer, A., Pacholik, L., Perl, T., et al. Conductive heat exchange with a gel-coated circulating water mattress. (2004) Anesth Analg 99(6): 1742-1746. 26. Nieh, H.C., Su, S.F. Forced-Air Warming for Rewarming and Comfort Following Laparoscopy: A Randomized Controlled Trail. (2017) Clin Nurs Res 1054773817708082. 27. John, M., Crook, D., Dasari, K. et al. Comparison of resistive heating and forced-air warming to prevent inadvertent perioperative hypothermia. (2016) Br J Anaesth 116(2): 249-254.